Sasindu came to our lab from Sri Lanka. An interest in exploring theoretical questions in animal movements led her to conduct controlled but elaborate ‘microcosm’ work within the laboratory. 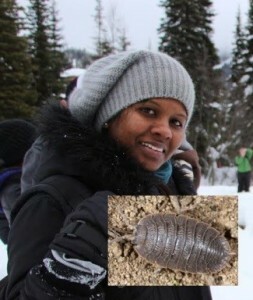 Her ‘model’ study animals were isopods, or as we like to call them in the lab, ‘roly polys’. Her work examined how the movement of animals out of their familiar home ‘habitat’ is influenced by changes in environmental parameters (food, humidity), and also once they leave, how their decision to continue ‘exploring’ is affected by conditions encountered en route. Sasindu has tracked the movement ‘decisions’ of a phenomenal number of these amazing little animals, and is now working on publishing her thesis.